Founded by George Habash after the occupation of the West Bank by Israel in 1967, the Popular Front for the Liberation of Palestine (PFLP) was formed as a resistance movement. Combining Arab nationalism with Marxist Leninist ideology, the PFLP sees the destruction of Israel as integral to its struggle to remove Western influence from the Middle East. During the 1970s the group fostered links with militant groups across the world, including the German Baader Meinhof organisation and Japan's Red Army. Working with other groups, the PFLP pioneered aircraft hijackings as a high-profile means of drawing attention to their movement, most notably with the capture of an Air France plane en route from Paris to Athens in 1976. The plane was flown to Entebbe in Uganda where, after a stand-off, Israel launched a dramatic commando raid to rescue nearly 100 hostages. During the 1970s, the PFLP was the second largest faction in the PLO, but pursued a markedly different strategy to Yasser Arafat's dominant Fatah organisation. While Fatah attempted to build support for the Palestinian cause from Arab countries, the PFLP became disillusioned with what it saw as inertia among Middle Eastern leaders. 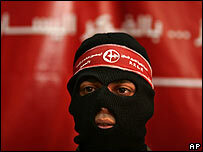 Instead the PFLP enlisted backing from Russia and China. 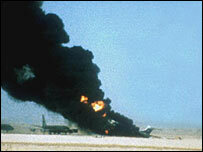 After 1978 the group switched the focus of its operations to attacks on Israeli and moderate Arab targets. But the decline and collapse of the Soviet Union during the late 1980s undermined the PFLP, and the group lost ground to the radical Islamic Hamas movement. Attempting to bolster its position after the supposed 1993 PLO-Israeli peace accord the PFLP added its weight to a disparate group of Palestinian organisations opposed to the deal. It boycotted Palestinian elections in 1996, but three years later, the PFLP accepted the formation of the Palestine Authority and sought to join Yasser Arafat's administration. The succession of Abu Ali Mustafa, who replaced an ailing George Habash in 2000, was seen by many in Israel as heralding a return to the group's radical policies of 1960s, 70s and 80s. But Mustafa was soon assassinated by Israeli forces in August 2001 - a sign, said some analysts, of how Israel saw the PFLP as a continuing force. Indeed the group struck back, shooting Israeli Tourism Minister Rehavam Zeevi, leader of a right-wing party, and claiming it as revenge for Mustafa's death. 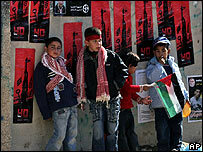 Israel alleges that Ahmed Saadat, the current leader of the PFLP, ordered Zeevi's assassination. Mr Saadat was imprisoned by the Palestinian authorities but later seized by Israeli forces and taken to Israel. Founder George Habash died in January 2008. Palestinian President Mahmoud Abbas described him as a "historic leader" and announced three days of national mourning.